The Territorials collection includes some of England's best loved cheeses. 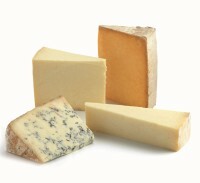 They are cheeses that are named after the regions in which they were historically produced. Stilton PDO (Pasteurised Cows' Milk, Vegetarian). Stilton cheese has its origins in the early 19th Century when travellers to the Bell Inn in the village of Stilton on the Great North Road found a cheese that was much to their liking. So many people started producing similar cheeses that in 1910 the producers had the foresight to lay down strict controls on where and how it could be made, including that it may only be produced in the three counties of Leicestershire, Nottinghamshire and Derbyshire. Our creamy mellow Stilton will fill the mouth with flavour but not be overpowering. The pleasant herby tang of the blue veining contrasts nicely with the rich creamy character of the paste. Westcombe Cheddar PDO (Unpasteurised Cows' Milk, Traditional). Westcombe Cheddar is one of only three cheeses entitled to the Slow Food designation "Artisan Somerset Cheddar". To qualify for this the cheese must be made in Somerset using unpasteurised milk from the farm's own cows, traditional rennet and be made by hand before being matured for up to 20 months. It is made in Evercreech near Shepton Mallet and has a complex flavour and a more moist texture than some Cheddars. Lancashire (Unpasteurised Cows' Milk, Traditional). Our Lancashire is made by Mrs Kirkham in the "black land of Fylde", north of Preston where the pasture land is near the Irish Sea and the tasty quality of the milk and its cheese is said to be due to the wind driven sea salt which impregnates the pastures. Mrs Kirkham's Lancashire is still made in the traditional way - where the outside is buttered, as opposed to the more common waxing - which allows a far superior maturing, giving a greater depth of flavour and interest to the cheese whilst retaining the fresh acidity which is so characteristic. Cheshire (Unpasteurised Cows' Milk, Vegetarian). Our Cheshire comes from the Appleby family's Abbey Farm - the name indicates the monkish origin of the cheesemaking - at Hawkstone, deep in rural Shropshire. The unique quality of Cheshire is said, with good reason, to emanate from the pasturage over the heavy salt deposits underlying the area of the Cheshire/Shropshire border, around Whitchurch and Nantwich. The cattle grazing there have been found to have an unusually high salt content in their milk and it would be strange indeed if that were not communicated to the cheese. Proper Cheshire cheese is unmistakable in its piquant flavour, the texture should be firm and crumbly but never dry.